We love Playdoh in our home. We use it almost daily and we love it. However, the one thing that constantly drives me crazy is that tiny pieces go everywhere and it can get messy. We found this amazing 2 ingredient playdoh that we tweaked a bit and added some glitter for color. The result was the best smelling, softest playdoh ever plus it was super easy to clean up! See below for how to make this and a few tips! Combine them equally in a mixing bowl and stir until the consistency starts to become more smooth. Depending on the conditioner that you use you may have to add a little more starch or conditioner. Once the consistency became smoother, we added a bit of glitter for color to make it fun and then it was time to play! Once you are done, your hands and the kids will smell amazing. The dough is very soft and easy to work with! I have read that typically people experience a lot of drying out of the dough with this recipe however we HIGHLY recommend that when you are done playing, simply roll it into a ball while making sure you get as many air pockets out of the dough as possible. Then tightly wrap the dough in saran wrap. Finally store the saran wrap dough in a sealed container and it will last a long time. We made this recipe a month ago and we are still using the same one and it hasn't dried out yet! This week we decided to join a fellow Cape Cod Mom and author of Nap Time is My Time blog in her reoccurring #WhipItUpWednesday blogs! We found so many great ideas on her linky party! There are links to recipes like homemade apple cinnamon rolls, crafts including these gorgeous fall leaf place cards, a TMNT halloween bucket and more! We linked up Adviser Suzanne Golden's Pumpkin Play-doh post too! Head on over and check it out by clicking the #WhipItUpWednesday graphic below and feel free to add your own or let us know your favorite fall projects! Are you crafty or do you get creative in the kitchen If so then today's Linky Party is right up your alley!!! Welcome to this week’s edition of Whip It Up Wednesday sponsored by Nap Time Is My Time! Check out our Eggplant Parm Sticks on the linky party! We would love to see what other moms are creating so link up something that you have done and share it with all our readers! From Nap Time Is My Time Blog: "I really enjoy seeing all of your handmade projects – there is so much inspiration out there! Keep in mind that a handmade project is either homemade or made by hand – not something you’ve purchased. It includes recipes, paper crafts, sewing projects, decorating ideas, photography, furniture transformations and much, much more! This handmade linky party will be open until Monday at 3pm EST. I’d love it if you’d grab the button and include it in your post or on your blog. Not required, but very much appreciated." 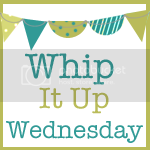 Whip It Up Wednesday - A fun way to share your creative projects! Check out Emily's Whip It Up Wednesday blog post at Nap Time is My Time! Every week she posts her own homemade item to share. Others are invited to share their own homemade items as well! A handmade project is either homemade or made by hand – not something you’ve purchased. It includes recipes, paper crafts, sewing projects, decorating ideas, photography, furniture transformations and much, much more! It doesn't have to be a current project either, it may have been a past recipe or craft project but it can still be shared on this. While I don't always post things I have done, sometimes I do share a few of my recipes and I may in the future share some photos or crafts I take on. I know there are tons of crafty moms out there is a huge variety of industries, I would love to see you join us on the Linky party and see your ideas! Share away and be proud of your creations! This handmade linky party will be open until Monday at 3pm EST.